I am away from home at this time. I will be checking email from time to time, though so if you have any questions about my product or ordering, please be patient. I will respond. Thanks! A unique country look from the Pacific Northwest. Each is a handmade one of a kind creation suitable for hanging in your home or country cabin. All of the parts used in our creations are harvested from the vast forests and rugged coastal areas of Southwest Oregon. We carefully select only renewable small forest products in order to maintain an eco-friendly process. Each driftwood mount is selected for it's own unique look. Sizes vary in height from approx. 12" to 18". Our double wall mounts vary from approx.18" to 30". We make various sized boxes to better match them with the differing shapes and sizes of the driftwood we collect. Because each piece is unique we cannot list all of them. We can assure you each piece has been carefully selected for it's shape and color. All of our creations are finished in lacquer with 40% sheen. 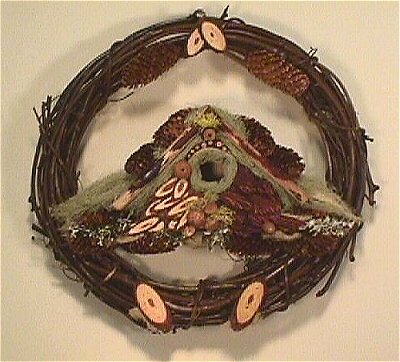 Some of the decorations we use: spruce cones, bark slices, pine limb slices, acorns,mosses, lichens and driftwood sticks and mounts. We can custom make a piece to fit your size needs. 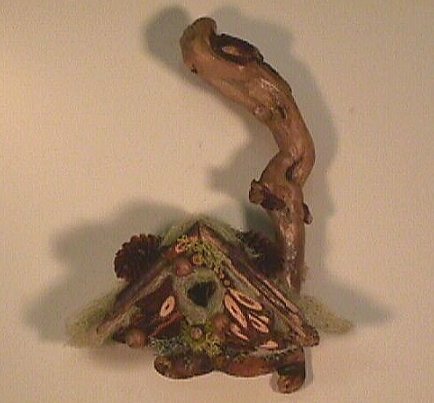 This double house wall mount is created with the same special care as our single wall mount using a longer carefully selected piece of driftwood gathered from the rugged coastal areas of Southwest Oregon. 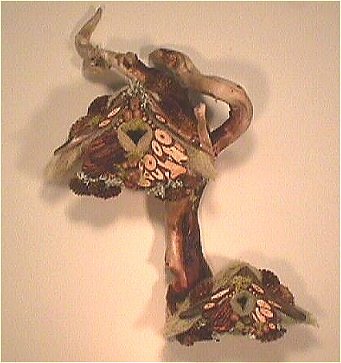 Because each driftwood piece is unique yours will vary from the picture listed. Ship by first class mail: $6.00 We accept checks or money orders. 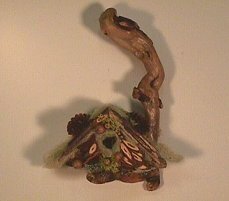 Free-hanging birdhouse has a removeable bottom. 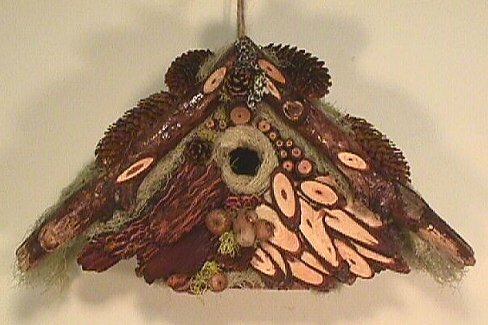 Each is one of a kind and decorated with renewable small forest products gathered from the beaches and woods of Southwest Oregon. Approx. 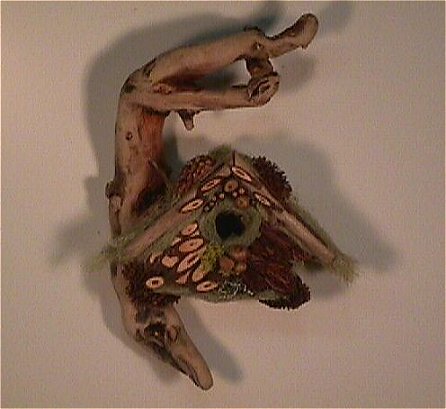 9"tall and 12"wide. 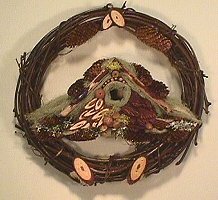 This attractive 12" wreath has a birdhouse mounted on it using the same unique parts and decorations as our other handmade products. In order to maintain an eco-friendly process we use only renewable small forest products.